There are few words that can truly capture the taste oysters. With the shucking of the oyster comes an exhilarating blend of unique flavors. They have been described as refreshing, smoky, nutty, buttery, sweet and salty upon the first taste and leaving behind notes of cucumber and melon. Your oyster connoisseurs will praise the nuances between each and every oyster. The sensual delight achieved upon eating them has been described as an aphrodisiac. Oysters are an essential item to spice up your menu. There are never ending ways to fully enjoy oysters. Aficionados prefer them on the halfshell, with a squeeze of lemon and a drop of hot sauce. Your chef can easily grill, bake, fry, steam, smoke or sautée them to the culinary bliss of your diners. Oysters are farmed easily and sustainably. As filter feeding shellfish, they don’t rely on wild-caught fish in the form of fishmeal and fish oil. By consuming algae, they help improve the water quality of the surrounding marine environment. With such low-impact on marine organisms and habitat, farmed oysters are on the green sustainability list across the globe. We are pleased to support industries that have perfected the art of aquaculture. 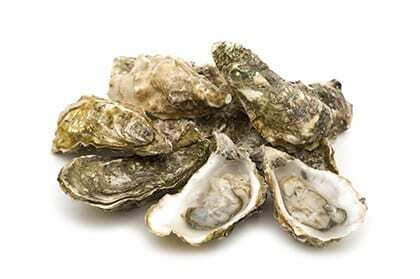 Oysters make an excellent choice for our health and for keeping our oceans vibrant. Join us in protecting the future of our oceans by providing your customers with sustainably farmed shellfish from Pucci Foods. Experience fresh oysters from Pucci Foods today by filling out the form on this page and our team will be in touch right away.